The American Cancer Society and the Cancer Awareness Network recognize that achieving a world free from the pain and suffering of cancer requires a comprehensive public policy agenda. Their work includes a strong focus on preventing cancer, seeking new cures and treatments and ensuring all Americans have access to the medical care that could save their life. They also support the determination and courage of cancer patients and survivors by working to improve their quality of life both during treatment and after it has ended. Click Here for more information. 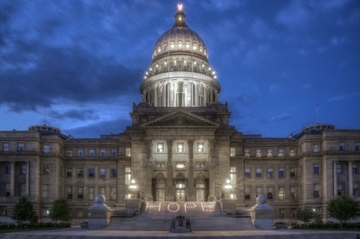 American Cancer Society lights the Capitol steps up with hope. BOISE — A bill to cut Idaho's income taxes by $51 million passed the Idaho House Thursday and now heads to the Senate. "I think it's important to remember that tax cuts are not static," said Majority Leader Mike Moyle, R-Star, who is sponsoring the bill. Moyle said the tax cut would help to stimulate the economy by leading to more consumer spending and also helping to draw residents and businesses who may be deterred by the fact that Idaho's income tax rates are higher than neighboring states. 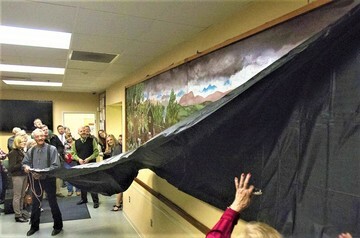 Artist Gary Stone unveils a new mural Nov. 21st at the Wellness Tree Community Clinic in Twin Falls. BOISE — Free medical clinics such as the Wellness Tree in Twin Falls may soon be exempt from paying sales taxes. “Growth in the free clinic services will help the health and welfare of our uninsured neighbors,” bill sponsor Rep. Clark Kauffman, R-Filer, told the House Revenue and Taxation Committee Thursday. The end of education week in the hearing process was an “only in Idaho” moment. As Janet Jessup, formerly from Jerome, started her presentation, she was surprised to see her seventh grade teacher, Mrs. Ohlensehlen in our hearing room. Mrs. Ohlensehlen was with a BSU Leadership Class. It says a lot about the staying power of our fine teachers through good and bad and the excellent students they produce. As we began the Health and Welfare hearings, one of the first harsh facts concerned those same children I mentioned last week who head for school each morning. We have over 2500 children in foster care. They have been removed from situations of neglect or worse. Many have been abused. Thank goodness for the good families who accept the responsibility to care for these children. The budget request was for a small increase to help foster parents with everything from diapers to school supplies. The sad fact is that most child neglect comes from drug abuse and the children are born with addictions. The nice event of the week had to do with some of our Jerome students. 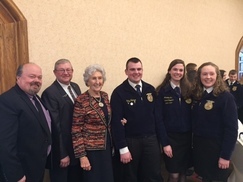 We met three of our great young FFA students from Jerome High School. If you did not know, the state president is our own Gretchen Hansten, who conducted the luncheon meeting like a pro. Rep.Kuaffman and I ate lunch with Mr. Clifton, Cody Jackson, and Annabelle Day. 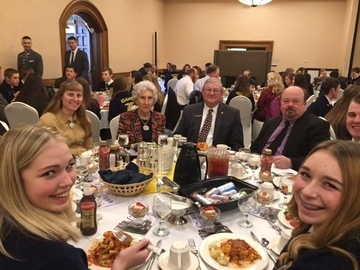 It is always an honor to have the FFA youth in Boise. While education and family welfare are the main activities for last week and this, other lesser but important budget work is going on. The effort to keep the mussels out of our beautiful lakes, rivers and irrigation systems is needing more attention. In 2016, the Dept. of Agriculture performed over 90,000 boat inspections. The result was 20 boats with mussels and only one boat with a live mussel. We cannot afford to have even one live mussel in our waterways. The state is working on a more active plan for the coming boating season. Another item to be funded will change the way our cattle are inspected. At this time, brand inspectors use a pencil and triple copies. With the opportunity to have a processing plant in Idaho, we could be checking two million head a day. The plan is to set up a new system with laptops to provide the brand inspectors the tools to keep our industry safe and have an opportunity to process cattle in our state. Rep. Bell and Rep. Kauffman meet with FFA students from Jerome. This was a busy week with more bills being introduced and coming to the floor for a vote. So far there have been 104 House bills and 40 Senate bills. I have been working on transportation issues, trying to get support for a variety of ideas to increase funding. Next week a bill will be introduced to extend the Surplus Eliminator sunset and include local jurisdictions in the funding. I had lunch with a room full of FFA students and that is always a pleasure. I was able to greet both Filer and Jerome students and advisors. This week started the “Steps for Schools” challenge to earn money for schools in district 25. I will do my best to get 10,000 steps a day for some of the prize. American Heart Assn/American Stroke Assn. 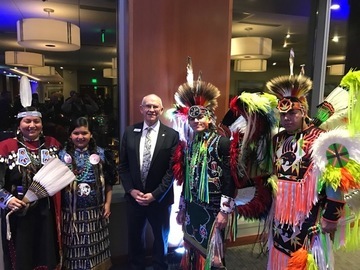 Representative Kauffman visiting with Coeur d'Alene leaders and dancers. 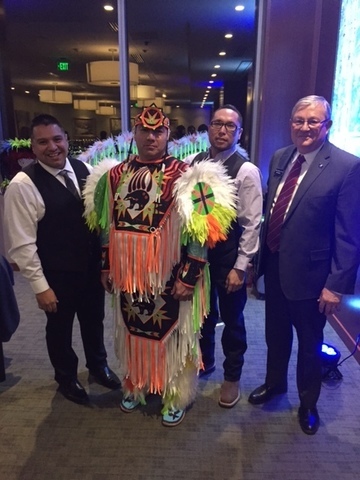 Senator Patrick visiting with the Coeur d'Alene dancers. 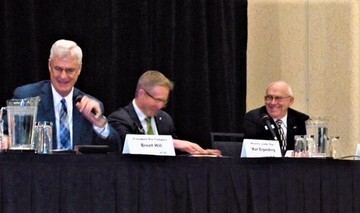 This week Senator Patrick was a panel speaker for the Idaho Bankers organization. Thus far this Legislative Session has been wrapping up its review of the administrative rules from the various state agencies. This is valuable process that allows the legislature reject rules or portions of the rules that are unduly burdensome or do not fit with the intent of the code. We have also been reviewing the governor’s appointments of individuals to the various state boards and commissions. We have been moving at a consistent pace. Senator Lee sponsored Senate Bill 1005 (Child Protection Act). Essentially the purpose was to amend the existing law and to revise definitions. It ensures human trafficking is included in definition “child abuse and neglect” and “sexual abuse”. This is required for the state to have an approved CAPTA plan. It enables Idaho to better protect children. It passed the Senate floor with a unanimous vote. Senator Harris sponsored Senate Bill 1009 (Crop Residue Burning). The DEQ reviewed and approved this change. This Bill increases the ozone evaluation threshold, which air quality levels cannot be exceeded, from 75 % to 90 % of National Ambient Air Quality Standard. This results in an increased amount of days in which one is allowed to burn. It is safe for Idaho’s air quality. It passed with 29 Ayes, 5 Nays. Health and Welfare reported to Joint Finance-Appropriations Committee. They have requested $151,498,200.00 for fiscal year 2018. They were appropriated 148,110,400.00 for current fiscal year. 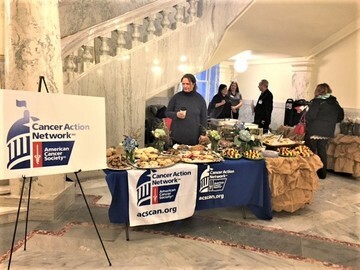 The Capitol had the pleasure of being visited by many groups including the American Cancer Society Action Network, FFA students, Idaho Community Bankers, and Northwest Career Colleges. On Tuesday, January 31, 2017 we celebrated Idaho Forestry Day. 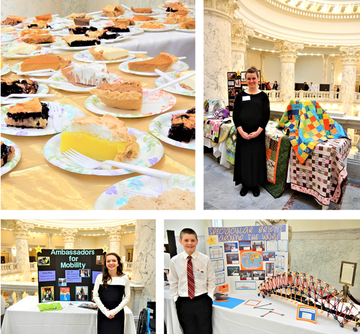 On Wednesday the Idaho Coalition of Home Educators sponsored “Pie Day” at the Capitol. The Coalition shared homemade pie with legislators and Capitol staff. Students also displayed projects they have been learning about during the past year. Rep. Kauffman visiting with a student from the Idaho Coalition of Home Educators.